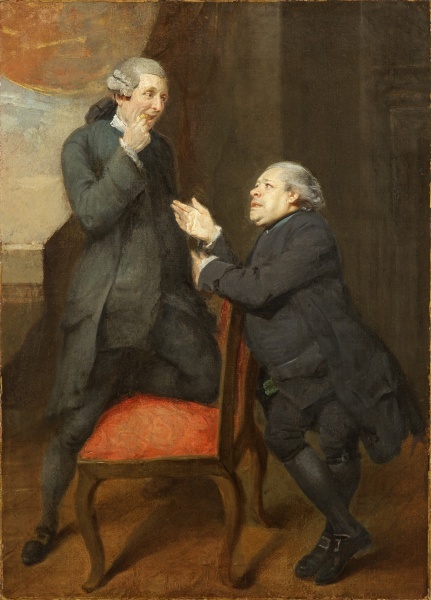 This curious conversation has recently been attributed to Zoffany. It may be a scene from a production of Dr Last in his Chariot that starred Jeffery Dunstan, a popular celebrity. Dunstan (1759?–1797) was only four feet tall and made his living selling old wigs. In 1785 he won a mock-election to become Mayor of Garrett, the traditional leader of a south London community. In this scene, the physician Last is offering ‘the juice of a simple yerb’ to a patient.